Look what I found outside Home Depot! There was more than enough to go around but the following week, they were all gone! Would. Ot consider buying any, but then we already have 2 very faded ones standing guard in our small veggie garden. These were planted there by a former neighbor years ago and remain even though the neighbor has since moved. No, I wouldn't have purchased one. We're not big lawn ornament people. The real question here is.....DID YOU?????. I do have one, that I purchased thru a fund raiser.. I think they are cute. Happy Sunday! Oh, you couldn't buy just one~! You'd have to buy at least 5 or 7. What fun. Oh my, I'm trying to think what a group are called. I don't think it's a flock. No, I would not buy one because they are everywhere around here! But I just might buy a REAL one! No wouldn't buy one, not my style but hey to each his own. Maybe as a joke. I always think Florida when I see one. But there is something nostalgic about them, and I'm all about nostalgia! 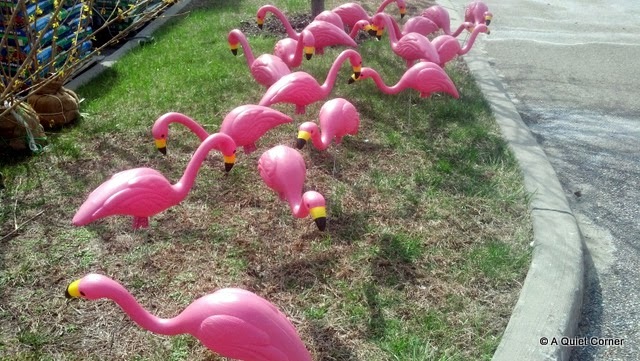 Look at all those pink flamingos! How cute! They do look cute in a big bunch like that - but, no, they aren't really my style. I have to admit, though, their cheerful color makes me smile.